These Christmas tree craft kits are great for kids and adults alike. Paint them and decorate them with the supplied pom pom baubles and glue on the variety on embellishments for truly unique tree hangings. Come supplied with jute twine and bead toppers for hanging. 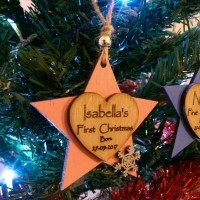 Baby's personalised first Christmas ornament, announcements of the pitter patter of new feet or a celebratory tree hanging will make a beautiful addition to any Christmas tree this year. 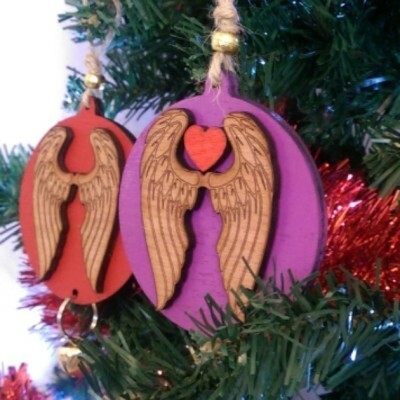 Designed and made to order, hand finished and decorated in a choice of colours, these tree hangings make a truly special gift to any new parent, Grandparents, God parents or people of significant importance who are destined to be part of a child's life. They mark a milestone which will be remembered for years to come and be hung with fond memories year after year. 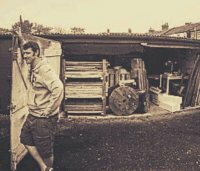 Laser cut from sustainable plywood in my workshop before being hand decorated and emblazed with a bespoke choice of laser engraved message, each is truly unique and will sit with pride on the tree of it's recipient. Laser cut from 4mm sustainable plywood and hung on jute twine with a beaded topper and snowflake embellishment. Each star measures 8cm in diameter.